This weekend more than 6,000 people were rescued in several operations on the Mediterranean Sea while making the treacherous crossing from Libya to Europe. Three-hundred-and-sixty-nine of those were rescued by the MY Phoenix a search and rescue vessel run in partnership by Médecins Sans Frontières/Doctors Without Borders (MSF) and MOAS (Migrant Offshore Aid Station). Early Monday morning an additional 104 people were rescued with the assistance of the MY Phoenix team and transferred onto a commercial vessel. The crew of 20 people which includes a professional crew of cam-copter operators, search and rescue professionals and medics engaged in their first rescue on Sunday afternoon, less than 24 hours after leaving the Maltese harbor. Those rescued were primarily from Eritrea and included pregnant women and roughly 45 children including babies. “Nothing prepares you for the sight of 369 people crammed into a fishing boat,” said Chris Catrambone, the co-Founder of MOAS along with his wife Regina. “The people we rescued yesterday afternoon were packed in so tightly that their legs had cramped and they struggled to move as we rescued them. 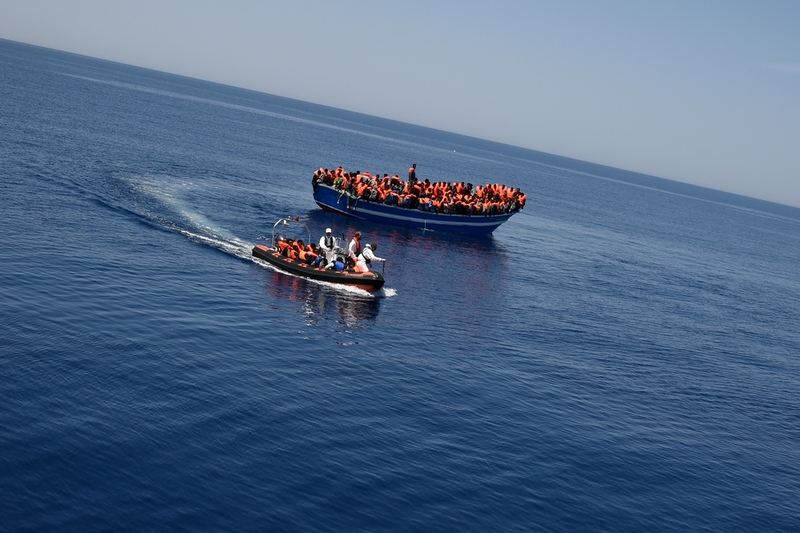 People rescued by the MSF and MOAS team. Those brought on board by the MOAS rescue crews on Sunday afternoon were given an initial triage by the MSF medical team who treated conditions including diabetes, dehydration, conditions related to pregnancy, skin infections and injuries sustained during beatings and violent attacks. All those rescued are currently in a stable condition and receiving food, water and other essential items onboard the MY Phoenix. “Yesterday we rescued 369 people, and helped save the lives of 104 more,” said Will Turner, MSF Emergency Coordinator. “The boat is absolutely crammed full and last night, as the men, women and children we rescued curled up under blankets to sleep, there wasn’t a centimetre to spare. Our teams in Pozzallo, Sicily, are currently providing support during the landing of more than 800 survivors of this weekend's Mediterranean crossing. Teams on the ground in Sicily will provide initial medical screening as well as health care and mental health support to the hundred of refugees, asylum seekers and migrants in need. Dr Erna Rijnierse takes the temperature of one of the 369 people rescued by the MY Phoenix on the first day of operations. It is feared that 2015 will be the deadliest year yet for those risking the Mediterranean crossing. So far this year an estimated 1,750 have drowned compared to 96 deaths during the same period last year. MSF is currently working onboard the MY Phoenix, a search, rescue and medical aid vessel in partnership with MOAS (Migrant Offshore Aid Station). We will rapidly reinforce search and rescue efforts in the Mediterranean with another boat, run solely by MSF to be launched in the coming weeks.